In a medium founded on action, Charlie Chan remains one of the few heroic figures in American film to function proudly as an intellectual. Chan's adventures in ratiocination were first recounted by Earl Derr Biggers in a series of six successful novels and eventually in 47 films made from 1926 to 1949 (as well as in a few parodies and semi-parodies that came after). Twentieth Century Fox Home Video has released four of the first Oland films on DVD in the first volume of what you hope will be a complete set of that studio's Chan films. (After World War II, the franchise moved with much-reduced budgets to the poverty-row studio Monogram; six of those films were released by MGM last year.) The decision represents a reversal for Fox, which had once removed the films from Fox Movie Channel, apparently embarrassed by the European Oland's "yellowface" portrayal of an Asian character. Are the Chan films racist? Not, I think, by the standards of their time. Mr. Biggers is said to have created Chan (based on a real detective, Chang Apana, who worked for the Honolulu police) to counter the negative images of Asians being fueled by the Hearst papers' "yellow peril" campaigns and embodied most repellently by Sax Rohmer's sadistic "Oriental" villain, Dr. Fu Manchu. Mr. Oland, a popular heavy of the silent era who played practically every ethnicity available (including, on occasion, a Swede), was the screen's first Fu Manchu, in the 1929 "Mysterious Doctor Fu Manchu" and three subsequent films for Paramount. 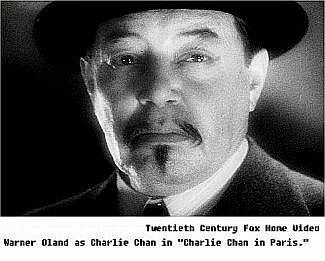 Recruited by Fox in 1931 for "Charlie Chan Carries On," a film that is now lost, Mr. Oland seemed to spend the balance of his life and career making up for the excesses of the Fu Manchu character. In the Fox set, both "Charlie Chan in London" (1934) and "Charlie Chan in Paris" (1935) contain scenes in which Chan coolly and wittily dispatches other characters' racist remarks. Chan, whose huge intellect mysteriously did not extend to an ability to master English articles ("Joy in heart more desirable than bullet"), might have been a stereotype, but he was a stereotype on the side of the angels. In addition to "Paris" (long believed lost) and "London," the Fox box contains "Charlie Chan in Egypt" and "Charlie Chan in Shanghai" (both 1935), as well as "Eran Trece" ("They Were Thirteen," 1931), the Spanish-language version of the lost "Charlie Chan Carries On," with the Spanish actor Manuel Arbó doing a careful Oland imitation in the Chan role. It's a reminder of the sad state of film preservation that three other early Chan films remain lost, though I'm at a loss to understand why Fox has not included "The Black Camel," a 1931 film with Mr. Oland as Chan and featuring Bela Lugosi in a major role, which does exist. The films have been restored from their once-familiar television syndication versions, and sound and picture quality is excellent, given the rarity and fragility of the original materials. The box set lists for $59.98; none of the films have been rated by the M.P.A.A.